Using your views, you can make ticket updates to many tickets at the same time. For example, if you want to assign yourself to a number a tickets, you just select them in a view and then set yourself as the assignee. You can also delete, merge, or mark as spam the selected tickets. If you navigate to different pages, your tickets will remain selected. The maximum number of tickets you can update at one time is 99 tickets. You cannot bulk update closed tickets. You can bulk update most of the same properties as an individual ticket, including ticket status, fields, subject, and comments. Note: You cannot use the Knowledge Capture app when you make bulk updates to tickets. For information about how specifying a default Twitter account affects bulk ticket updates, read about the Make this the default account setting described in Setting up your Twitter channel. Open one of your views and select the tickets you want to update. You can pick and choose the tickets you want to update or select the entire list by clicking the check box at the top left of the view. In Update tickets you can update ticket properties for all of the tickets you selected. You can also apply a macro to all the tickets by selecting it from the Apply Macro menu. If you want to cancel the bulk update, click the X in the upper-right corner. Only ticket fields that apply to all of the brands of the selected tickets display. Click Submit to save your ticket updates. Note: Most active ticket fields are displayed in the view during a bulk update, regardless of the form(s) applied to the selected tickets. However, the CC field does not appear as the bulk ticket editor cannot be used to add CC's to a ticket. This includes using the bulk editor to apply macros that have an action to add a CC. The CC will not be added if the macro is applied this way. You can select multiple tickets in a view and delete them at the same time. Deleting a single ticket is described in Deleting tickets. Once deleted, tickets are moved into a Deleted Tickets view, where you can restore them or permanently delete them. After 30 days deleted tickets are permanently deleted and removed from the Deleted Tickets view. You cannot bulk delete Closed tickets. For details, see Deleting tickets. Note: Administrators must enable agents to delete tickets. On Essential, Team, or Professional, click the Admin icon ( ), select Settings > Agents, then click Agents Can Delete Tickets. On Enterprise, permission to delete tickets is based on Custom agent roles). Open one of your views and select the tickets you want to delete. You can pick and choose the tickets you want to delete or select the entire list by clicking the check box at the top left of the view. Click the arrow icon on the Edit tickets button on the upper-right side, and select Delete. When prompted, click Yes to confirm that you want to delete the tickets. You will not be able to recover the tickets after you confirm the deletion. The tickets are permanently deleted. You can select multiple tickets in a view and merge them into another ticket. Merging one ticket into another ticket is described in . Be sure that you merge the correct tickets. Ticket merges are final; you cannot undo or revert a ticket merge. You cannot merge tickets with a ticket that's shared, or with one that's already closed. Open one of your views and select the tickets you want to merge. You can pick and choose the tickets you want to merge or select the entire list by clicking the check box at the top left of the view. Click the arrow icon on the Edit tickets button on the lower-right side, and select Merge tickets into another ticket. Tip: Be sure to have the ticket number of the ticket you want to merge into handy before you start the merge process. 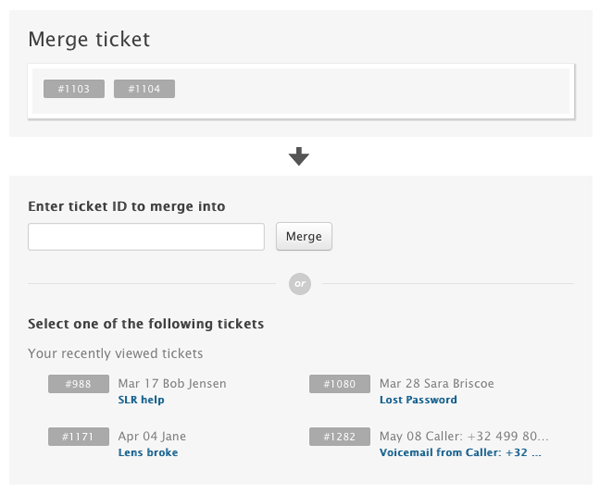 In the Merge ticket dialog, enter the ticket number for the ticket you'd like to merge the selected tickets into, then click Merge. Alternatively, you can select a recently viewed ticket. When prompted, click Confirm and Merge to confirm the merge. If you want to cancel the merge, click Close instead. You can select several tickets in a view to mark as spam and suspend the requesters. Marking a single ticket as spam is described in Marking a ticket as spam and suspending the requester. Tickets marked as spam are permanently deleted and the requesters are suspended at the same time. You can unsuspend suspended users if necessary. Open one of your views and select the tickets you want to mark as spam. You can pick and choose the tickets you want to mark as spam or select the entire list by clicking the check box at the top left of the view. Click the arrow icon on the Edit tickets button on the upper-right side, and select Mark as spam. When prompted, click Yes, mark as spam and delete tickets to confirm the deletion. If you use an external online form to submit emails to your Zendesk account (an unsupported workflow) and you see an influx of spam tickets arriving from that form, then marking these tickets as spam could negatively impact the IP address associated with your form and cause the IP address to be blacklisted. To help prevent these types of attacks, add CAPTCHA to your form. Then, transition to a supported API, Help Center form, or web widget solution. How do you bulk edit tickets in the iOS app? From your views there should be a menu that'll give you the option to select multiple tickets. Tap the little circle next to the tickets you want to you edit, and then tap "Properties" in the lower left corner. That'll take you to a screen where you can edit the ticket properties and comments, and when you submit those changes they'll be applied to all the tickets you selected. I don't see the option you're talking about. I don't suppose you could attach a screen grab of what you're talking about? Well that's annoying, the 'edit' option is there now, what did you do? Did you hit a magic green button at ZD HQ and sneak it in while I wasn't paying attention? It could be that the app just needed to be updated or refreshed/restarted. In any case, I'm glad you've got what you need now! Let me know if you have any other questions! Is there a way to bulk change Organization view for tickets "user can view own ticket only" across all organizations? Can it be done on the back end? Are you referring to the setting in the user profile? If so, you can do a bulk user import to update the information as detailed here, or you should be able to update the information via the API. Hang on a minute, the edit button is there for Zendesk on the iPhone, but not on the iPad. On both the app is the latest version. Hi Tony! You're not going crazy, I promise! I checked with one of my mobile devs to confirm, and the edit button exists in the iPad app for suspended tickets *only*. The mobile apps for iPhone and iPad are similar in a lot of ways, but they're not identical; some things have to be different in order for them to work properly on their respective devices. We always try to mirror all the features but some of them we haven't been able to, and this is one of them. I don't have any timeline for when (or whether) this will be changed. I did some looking in our [Product Feedback Forum](https://support.zendesk.com/hc/communities/public/topics/200132066-Community-Zendesk-product-feedback), and I was able to find a post that's related to this: [Bulk update on Apps](https://support.zendesk.com/hc/en-us/community/posts/203437706-Bulk-update-on-Apps-). The post is a couple years old and doesn't have any comments yet, but I'd encourage you to add your use case to to the thread to help our Product Managers understand the need behind this functionality. Please let me know if you have any other questions! I'm trying to use the bulk edit feature to update several tickets at once by applying a macro that uses Liquid Markup for customization. The placeholders seem to operate as expected in the ticket comments, however, all my liquid code for the subject is getting pulled over rather than the intended output. Any insight as to why the liquid template I have set up for my "Set Subject" macro can't be applied to multiple tickets? Megan, thanks for the reply! So the comment saved text resolved to the correct output with the liquid templates I have in there, but the liquid markup language did not resolve in the subject field. Liquid works in the subject field when I'm editing a ticket, so I thought they'd also work in bulk editing multiple tickets, and my experience is telling me otherwise! When I look in these tickets and copy/paste the subject I have re-saved in them, what I'm seeing is that the code is being cut off - probably something to do with a character limit in the bulk edit module for subjects? I took a look - that is definitely the issue, the subject field is limited to 255 characters! Hopefully that clears up the confusion! Any chance that could be... expanded to ... like a lot more? I LOVE being able to bulk edit subjects for tickets based on our ticket fields and conditions! I would be kind of surprised if they expanded it, but it sounds like a great feature request - especially because you have a legitimate use case for this! Hey - I'd like to send bulk macros, but also include an attachment (the same attachment to all tickets). I'm not sure what you mean by "bulk macros"...can you clarify what you're trying to do a little bit? Can you add an attachment to each ticket being bulk updated? You wouldn't be able to do this using the in-product bulk ticket editor, but you should be able to do it using the API. You can find information on that in our Developer resources. I wanted to add that deleted tickets can now be recovered due to a new feature released in October. How can I bulk update the Organization of Closed tickets? The users/requesters themselves have recently been updated for the correct organization, but the organization isn't reflected in Closed tickets. This results in "empty value" organizations in my reports, which isn't helpful. By design, the properties of closed tickets cannot be changed. 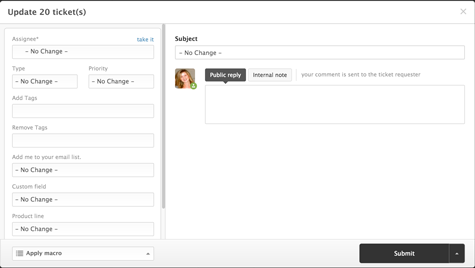 This has been a topic of community suggestions / requests for years, for example in https://support.zendesk.com/hc/en-us/community/posts/204334258-Edit-or-Reopen-Closed-Tickets and https://support.zendesk.com/hc/en-us/community/posts/203432576-Add-tags-to-closed-tickets, but it seems fairly central to the system's design and performance, and to date I've seen no sign that Zendesk is contemplating a change in this. How can I bulk update tickets in the iOS Support app? I'm looking into this for you; in the meantime can you tell me more about what kind of update you're trying to make? So the answer to your question does depend on the kind of bulk action you're wanting to take. You can bulk delete, mark as spam, or recover. But there aren't any other bulk updates you can make to tickets via the app. Would be great to have a macro for adding item to Analytics before deleting a ticket. There could be subject and communication channel defined and then do it as bulk weekly or monthly basis. Adding item to analytics one by one is a bit frustrating if most of the tickets are for example Library card requests. Thanks for the feedback, Anu. How can I bulk delete spam tickets in Zendesk?